Allison Salamoni was chosen as Acadian’s 2016 EMT of the Year for the Louisiana/ Mississippi operations. Allison has been employed with Acadian since 2012 and is stationed in Plaquemine, Louisiana. 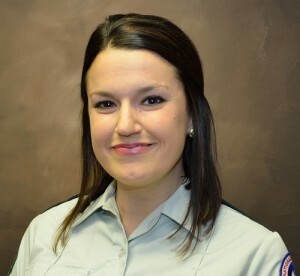 Allison received her EMT training through Acadian’s National EMS Academy. She is a graduate of Louisiana State University’s Fire and Emergency Training Institute, where she received firefighter and hazmat training which she put to use while working as a firefighter with the Port Allen Fire Department. Allison also graduated from Southeastern Louisiana University with a bachelor’s degree in General Studies and a minor in Family and Consumer Sciences. In her first year with Acadian, Allison and her partner were dispatched to an older man’s house for a fall. They assumed they would just be helping the patient back up, and would then carry on with their day. Instead, they ended up walking into any patient’s worst nightmare. The patient lived alone, and his neighbor had not seen him get his mail in a few days and decided to check on him. The neighbor found him wedged between his bed and nightstand, and immediately called 911. The patient had been stuck there for three days, incapacitated, on the floor. Allison and her partner assessed the patient and found him to be severely dehydrated. Allison cleaned him up, and got him into the best position of comfort she could at the time. She and her partner began to transport and pushed through the morning rush-hour traffic of Baton Rouge. Allison say she will forever remember this call, as all she could think about was her own family as she cared for him. This is one of those calls that reminds her day-in and day-out of why she does this job. Acadian can count on Allison to represent the team in the most professional manner. She has served as one of the Governmental Relations Coordinators for the Baton Rouge area. She has also been a champion for wellness and fitness and serves on the safety committee. She genuinely cares about her patients. Allison is an avid runner and competes in marathons. Her other hobbies include strength training and cooking.